It was such a huge day in every respect for the US indices yesterday we thought you might like an update. Therefore, above is today’s ratio table, but rather than go through each individually we thought it best to do them all together. One major point to note was the major systems overhaul, mainly on the NDX, but really across the board. There was, and still is, a slight hiccup in the SPX, but if other people’s systems were not fully switched over then any algo trading would have had an interesting time of it, and let’s face it, where derivatives are concerned what other sort of trading is there? So, coincidence the big rise or not, who knows. Basically, all three hit their zones bottom boundary’s early on, causing the first pause. 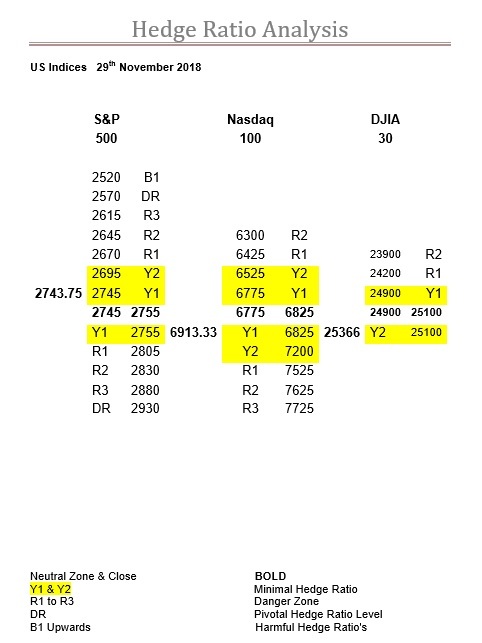 For the DJX this was at 24900, the NDX at 6775 and the SPX at 2695, which we know is just Y2 in the table but as we have been saying for quite a while now 2695-2705 is very likely the next level. Ironically, the high in the SPX yesterday was 2744, which is a test of the current zones bottom boundary. And, yes, where ratios are concerned it does work like that. Which just goes to highlight for the SPX the absolute minimum ratio between where the zone is and where it should be, so no real surprise that this move happened. Likewise, for both the DJX and NDX, once over their bottom boundary’s one had 200-points of zero ratio above it and the other 50-points, and being slipstreamed by the SPX, again no surprise. Furthermore, all three are rather devoid of meaningful ratio above their zones as things stand. Trading range is the zone bandwidth the respective markets are in. Finally, it seems a very long time ago all three were hitting the R ratios going southwards and we were saying to take note of how much there was of little or no ratio above them, so it may seem exciting but really it is all as normal and predictable as pie. Will the FTSE remain as predictable and a momentus level for the DAX, today’s Ratio Table, levels and comment.